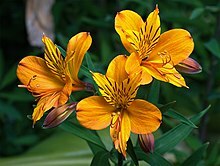 Alstroemeria (/ˌælstrɪˈmɪəriə/), commonly called the Peruvian lily or lily of the Incas, is a genus of flowering plants in the family Alstroemeriaceae. They are all native to South America although some have become naturalized in the United States, Mexico, Australia, New Zealand, Madeira and the Canary Islands. Almost all of the species are restricted to one of two distinct centers of diversity, one in central Chile, the other in eastern Brazil. Species of Alstroemeria from Chile are winter-growing plants while those of Brazil are summer-growing. All are long-lived perennials except A. graminea, a diminutive annual from the Atacama Desert of Chile. 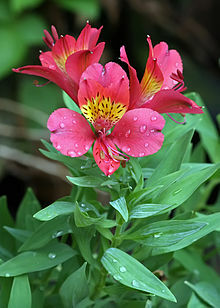 Wikimedia Commons has media related to Alstroemeria. The genus was named after the Swedish baron Clas Alströmer (1736–1794) by his close friend Carl Linnaeus. Plants of this genus grow from a cluster of tubers. They send up fertile and sterile stems, the fertile stems of some species reaching 1.5 meters in height. The leaves are alternately arranged and resupinate, twisted on the petioles so that the undersides face up. The leaves are variable in shape and the blades have smooth edges. The flowers are solitary or borne in umbels. The flower has six tepals each up to 5 centimeters long. They come in many shades of red, orange, purple, green, and white, flecked and striped and streaked with darker colors. There are six curving stamens. The stigma has three lobes. The fruit is a capsule with three valves. Alstroemeria are classified as an inferior monocot, meaning the petals are located above the ovary and the leaves are parallel. Many hybrids and at least 190 cultivars have been developed, featuring many different markings and colors, including white, yellow, orange, apricot, pink, red, purple, and lavender. The most popular and showy hybrids commonly grown today result from crosses between species from Chile (winter-growing) with species from Brazil (summer-growing). This strategy has overcome the florists' problem of seasonal dormancy and resulted in plants that are evergreen, or nearly so, and flower for most of the year. This breeding work derives mainly from trials that began in the United States in the 1980s, the main breeding is done nowadays by companies in the Netherlands. The flower, which resembles a miniature lily, is very popular for bouquets and flower arrangements in the commercial cut flower trade. Most cultivars available for the home garden will bloom in the late spring and early summer. The roots are hardy to a temperature of 23 °F (−5 °C). The plant requires at least six hours of morning sunlight, regular water, and well-drained soil. Some alstroemerias have escaped cultivation and become weeds, such as Alstroemeria pulchella. and A. aurea, which are now weeds in Australia. ^ Alstroemeria. Flora of North America. ^ "RHS Plant Selector Alstroemeria 'Apollo' AGM / RHS Gardening". Apps.rhs.org.uk. Retrieved 2013-04-30. ^ "Alstroemeria 'Cahors'". Royal Horticultural Society. Retrieved 5 January 2018. ^ "Alstroemeria 'Celine'". Royal Horticultural Society. Retrieved 5 January 2018. ^ "RHS Plant Selector Alstroemeria 'Coronet' AGM / RHS Gardening". Apps.rhs.org.uk. Retrieved 2013-04-30. ^ "RHS Plant Selector Alstroemeria 'Friendship' AGM / RHS Gardening". Apps.rhs.org.uk. Retrieved 2013-04-30. ^ "Alstroemeria 'Oriana'". Royal Horticultural Society. Retrieved 5 January 2018. ^ "RHS Plant Selector Alstroemeria 'Orange Gem' AGM / RHS Gardening". Apps.rhs.org.uk. Retrieved 2013-04-30. ^ "RHS Plant Selector Alstroemeria 'Orange Glory' AGM / RHS Gardening". Apps.rhs.org.uk. Retrieved 2013-04-30. ^ "Alstroemeria 'Perfect Blue'". Royal Horticultural Society. Retrieved 5 January 2018. ^ "Alstroemeria 'Phoenix'". Royal Horticultural Society. Retrieved 5 January 2018. ^ "Alstroemeria 'Red Elf'". Royal Horticultural Society. Retrieved 5 January 2018. ^ "Alstroemeria 'Sirius'". Royal Horticultural Society. Retrieved 5 January 2018. ^ "Alstroemeria 'Sonata'". Royal Horticultural Society. Retrieved 5 January 2018. ^ "Alstroemeria 'Spitfire'". Royal Horticultural Society. Retrieved 5 January 2018. ^ "Alstroemeria 'Tessa'". Royal Horticultural Society. Retrieved 5 January 2018. ^ "RHS Plant Selector Alstroemeria 'Yellow Friendship' AGM / RHS Gardening". Apps.rhs.org.uk. Retrieved 2013-04-30.